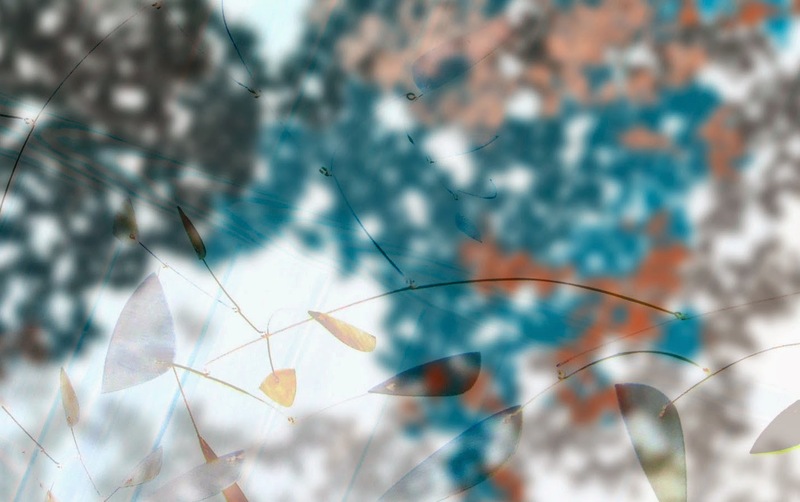 Werner Sun (www.thecolortree.net) is an artist who probes the formation of knowledge and uncertainty through drawings, digital images, and paper sculpture. As a physicist and IT manager at Cornell University, he addresses similar concerns, although from a different perspective. Werner's work has been shown in upstate New York and beyond, and he gives public talks on the intersection of art and science. Apart from scientific journals, his writing and artwork have also appeared in Lunch Ticket and Stone Canoe. When I was ten years old, my father introduced me to Alexander Calder by way of a cheap mass-produced mobile that he hung from our living room's cathedral ceiling. By that point, in the mid-1980's, the marketplace was inundated with imitations of Calder's groundbreaking sculptures, and mobiles had become a fixture of modern interior design. I have always found it curious that the development of the mobile as a serious art form essentially began and ended with Calder, and later artists adopting the same style (myself included) would not escape his long shadow. In liberating sculpture from the pedestal, he seemed to have discovered a mode of expression that was fully formed, universal, and impossible to improve upon. Of course, Calder went further than simply turning sculpture on its head, flipping the anchor points from the floor up to ceiling. His primary innovation was his daring use of randomness to set his mobiles in motion. Although his earliest experiments with kinetic art featured electric motors and hand cranks, by 1932 he had abandoned deterministic movement in favor of the unpredictability of environmental factors. By ceding control over his work to ambient air currents, Calder made Nature the puppeteer for these hanging sculptures. It was his embrace of the unknown that gave his mobiles a purity of exuberance and lyrical grace, free from human intervention. However, a mobile's overt dialogue with randomness overshadows a second oblique reference to it that anticipates the new view of geometry championed by Benoit Mandelbrot in the years around Calder's death in 1976. Mandelbrot was launched on his journey by a deceptively simple question: What is the length of Britain's coastline? He came to realize that the answer depends on whether one measures this coastline in segments of a yard or a foot or an inch. In fact, as the unit of measurement gets shorter and shorter, the apparent length of the coastline can grow without bound. This astonishing result is a consequence of the twists and turns in the coastline that can be seen at all levels of magnification. So, unlike a square or a circle of the standard Euclidean geometry that we study in high school, a coastline cannot be said to have a definite length. The jagged coastline of Britain falls into a category of geometrical object known as fractals. Fractals are mathematical constructions of literally infinite complexity that call to mind the "roughness" of everyday objects. For example, an architect might model the surface of a concrete slab as an idealized, perfectly smooth Euclidean plane. However, a real concrete slab is riddled with microscopic mountains and valleys that are absent from the simplest Euclidean approximation. For many practical purposes, these irregularities can be dismissed as random noise without tremendous repercussions. However, what emerges from the study of fractals is that this roughness itself can be elegantly described as having a fractional spatial dimension (hence the term "fractal"). In other words, a real concrete surface, instead of being a conceptually straightforward two-dimensional plane, actually lives in the strange and messy world somewhere between two and three dimensions. Fractals give us a vocabulary to address what was previously indescribable. Another common fractal in nature can be found in the repeated branching of tree limbs. Algorithmically, a tree starts out with a single trunk that splits into two branches, and each of those branches splits again into two smaller branches, and so on. Because the splitting process occurs recursively throughout the entire structure, one could isolate any limb, and it would look like a miniature version of the original tree. 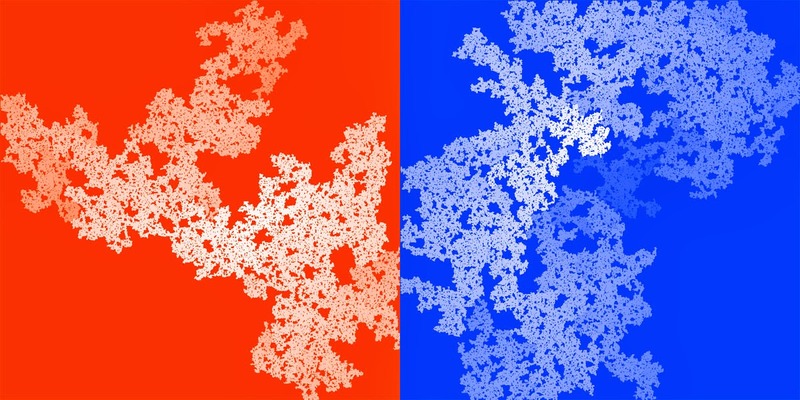 Hence, this fractal tree, like most other fractal structures, is a self-similar object. 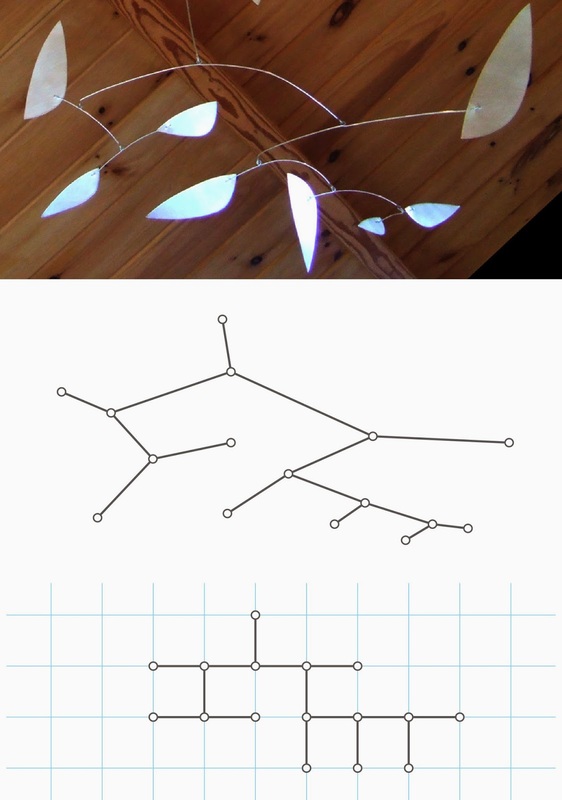 As it turns out, a Calder mobile has the same fractal structure as a tree, except that it grows downward from the ceiling instead of up out of the ground. To illustrate this correspondence, and not wanting to run afoul of the Calder Foundation's lawyers, I have depicted a mobile of my own construction in the top panel of Figure 1. By extracting the physical connections among the pieces of this mobile, I obtained the reduced graphical representation in the middle panel, which exposes the mobile's tree-like structure. Going one step further in abstraction takes us to the last panel, where the nodes of this graph have been repositioned to lie on a square grid, giving it the look of a network diagram or an electronic circuit board. and a rearrangement of this graph on a square grid (bottom). To further explore this branching structure, I used this regularized graph as a starting point, and I wrote a computer program to generate other pseudo-random mobile diagrams on a square grid. Some examples are shown in Figure 2. The computer adds the connections step by step, applying repeated actions beginning from a single seed point, and the structures unfold like a drop of water spreading on tissue paper. Each of these diagrams could, in principle, serve as a blueprint for a mobile. Figure 2: Pseudo-random mobile structures generated with various grid spacings. Figure 2 also shows how these generated networks become more organic as the grid spacing is shortened. Taken to an extreme in Figure 3, the spacing is reduced to a single pixel, and the fractal nature of these mobile structures is now readily apparent. This exercise demonstrates that a mobile consisting of thousands of elements, when viewed from a distance, would look like a cloud or a continent. Thus, mobiles and trees and many other natural forms are all connected by the same underlying mathematics. They are all fractals. 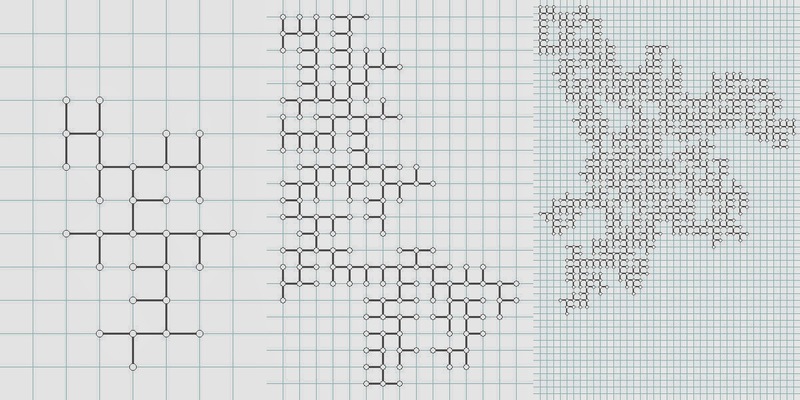 Figure 3: Pseudo-random mobile structures generated with single-pixel grid spacing. with each successive step of the computer program. Although Calder's mobiles boast a common mathematical lineage, he has built a seemingly endless number of variations on this theme. That each of his mobiles projects an individual character is a testament to his powers of invention. Every mobile is a specific manifestation of a fractal archetype, and it is this very specificity, this diversity amid constancy, that gives Calder's mobiles a contemporary relevance. As beings who engage with the world, we instinctively wish to explain what we see. But in our quest to find the most general rules of reality, we are trapped by specificity, by the fact that our observations are limited to a particular time and place and circumstance. We want to map the whole world, but, being of the world ourselves, we have to do so from a particular location in it. By virtue of our existence, our senses are hobbled by their finite capabilities, and we are obliged to sally forth with only an incomplete picture of reality as a guide. Another name for specificity is randomness, the uncertainty engendered by a lack of data. Because a mathematical fractal is an infinite, intangible object, any real-world fractal is really just an approximation or a truncation of a full-fledged fractal. Watching a mobile dance in the air, we can only guess at the form of the underlying archetype of which the physical mobile is a mere fragment. To construct a physical mobile, an artist lifts the veil on just a tiny corner of reality, the same way a photographer takes a picture, or a writer tells a story: not by laying out everything under the sun, but by offering only choice bits of information. Of course, one could say the same of any of the fractals found in nature -- clouds, mountains, coastlines, trees. But the novelty of the mobile form, free from cultural and historical precedents, lends itself to a heuristic examination of randomness, that modern-day bogeyman. Ultimately, then, mobiles are anti-reductive. They are not conveyors of a static, packaged truth; instead, they question whether such a truth is even within reach. They are scientific instruments that react to the environment, transmitting raw data to us while also encoding in their structure the way in which data get distilled into knowledge. They fill space with a fractal form that, were it not constrained by the need to exist, might extend over the entire universe. To those who worry that scientific advances portend the loss of wonder, mobiles assert concretely that there can be no wonder without knowledge. We must first observe the stars before we can ask what lies beyond them. In creating the mobile form, Calder selected the sleek materials, flat colors, and hard-edged biomorphic shapes that were emblematic of the twentieth century's modernist worldview . At the same time, however, a mobile cannot be seen as a self-enclosed object consistent with the mechanistic worldview of that century. If we paraphrase Mandelbrot and ask "what is the shape of a mobile? ", we find the answer is inherently uncertain. A mobile is not cleanly delineated from its surroundings; it is woven into the air, and it relies on fluctuations in its environment to give it life. Like a concrete slab, its surface occupies the ambiguous space between two and three dimensions. This man-made construction of the machine age turns out to be tempered by a deeply embedded provisionality that is entirely at home in our current data-driven zeitgeist. To viewers of today, the mobile is a powerful testament not only to the primacy of information but also to its inherent and paradoxically expansive limitations.